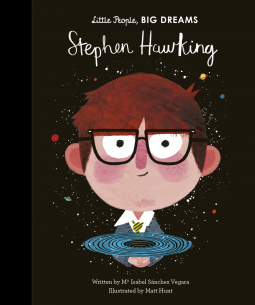 Always remember to dream big: Stephen Hawking – Joyce's mystery and fiction book reviews with some non-fiction too! I adore the Little People, Big Dreams series of books. They are inspirational and informative. I found this title on Stephen Hawking to be one of the best. As always, the illustrations are lively and appealing and they enhance the text. Stephen Hawking had a rich intellectual life and also faced unimaginable physical challenges. All aspects of his life, scientific work and diagnosis of ALS are simply but fully covered in this story and in the additional facts section. Hawking’s remarkable mind and thought processes are noted as is his groundbreaking discovery on black holes. Future scientists will be inspired by this short book. Many thanks to NetGalley and the publisher for a wonderful new entry in a wonderful series. The opinions are my own.